There is a chart at the end of this page. It suggests two possible routes through the New York City airspace. Obviously, the routes could be flown in either direction. For more detailed, or unmodified, charts of the New York City area, look in the Library under Charts. The Helicopter Route Chart might be of particular interest. Several "hot points" are included. Click these links to see what the area looks like from that location. Use the frequency 123.05 to self-announce on the Hudson River. Turn on every light you have and maintain the right side of the river below 1300 ASL. Be especially careful to watch for helicopter traffic between JRA (near the Empire State Building) and the Statue of Liberty. If you fly between the Lady and Newark airport, you must be at or below 500 ASL, and at least 500 feet away from "any person, vessel, or object." La Guardia Tower controls the airspace within six miles of LGA, up to 2000 feet. Contact the tower on 119.95 or 126.05 to use this airspace. They are is using the River Visual 13 approach, you will not be allowed to fly the route shown in blue because it conflicts with that approach. For the northeast-bound transition, call the tower near Governor's Island and ask for "Central Park and the tower cab" at either 1500 or 2000 feet. Going the other way, call the tower from 8 - 10 miles east. Ask for "tower cab, Central Park, Hudson River southbound." Some important landmarks are also emphasized on the chart. If you click on the symbol, you will see a picture of the landmark. Follow the Connecticut and Westchester County shoreline southwest. When you look for Rye Playland, the amusement park at LGA 14 DME, you will probably find it easier to spot the horseshoe-shaped breakwaters nearby. After you pass Playland, descend below 1500 ASL if you're not down there already. You will need to be below 1500 before flying within 11 NM of LaGuardia, to avoid the Class B airspace. Look for David's Island, about 7 NM from LGA. If you track 300 degrees from this point, you will be able to remain outside the 6 NM radius of LGA's Class B surface area. Your track will take you past the Yonkers Raceway toward a group of three apartment buildings on the east shore of the Hudson River. There is a fourth, white, apartment building near these, a little to the South. This fourth building is sometimes easier to spot because of its lighter color. Turn south along the Hudson and descend below 1300 feet. You must be at this altitude before you're over the Hudson River. Stay over the river, and maintain the right side at all times. Northbound traffic will be just a few hundred feet off your left wing. The G.W. Bridge is an excellent place to radio a position report on 123.05, and it's mandatory now. You will probably also hear other pilots reporting customary fixes like Central Park, Intrepid, the Empire State Building, the Battery (at the southern tip of Manhattan), and of course the Statue of Liberty herself, usually called the Lady. You can circle the Lady (FAA suggests left turns), but be careful if you do. Don't circle opposite the direction of anyone else who's doing the same thing. You must be at or below 500 feet behind the Lady (New Jersey side), and you must also remain at least 500 feet from any "person, vessel, or object." You can use New York Harbor to carefully turn around and retrace your route in the opposite direction. You can continue southbound, climbing no higher than 1400 feet after you pass the Verrazano Narrows Bridge. Or, you can turn around and follow the Blue Route into New York's terminal airspace. Northbound, while you are still below the Class B airspace, call LaGuardia Tower on 119.95 or 126.05 before you reach Governor's Island. These are special Tower (not Approach) frequencies for aircraft passing Through LGA airspace but not landing there. They apply from the surface up to and including 2000 feet, within 6 NM of LGA. Tell the tower you want to fly over Central Park and the tower cab, then eastbound. Also request an altitude where they can handle you, either 1500 or 2000 feet. 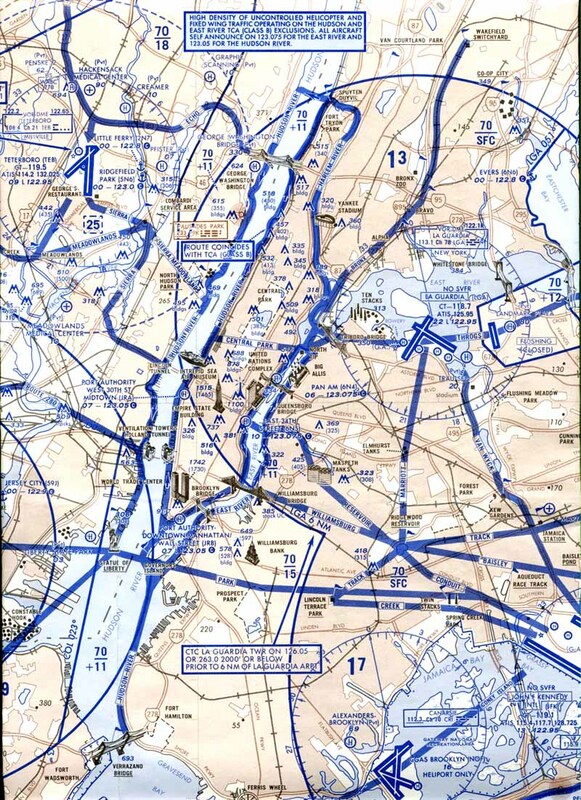 When you get your Class B clearance, you will probably be instructed to fly over Central Park, the North Tip of Roosevelt Island (between Manhattan and Queens), the Tower Cab, and the South Stanchion of the Throgs Neck Bridge. There are two bridges east of LGA. Don't head for the nearby Whitestone Bridge. Head for the Throgs Neck Bridge, which is farther east from LGA, and make a point of crossing its South stanchion. This keeps you clear of arrivals and departures on LGA's runway 4/22. Ellis Island is just north of the Lady. Just a little farther north is the Goldman Sachs building, also reported as the Colgate Center. There's a large clock on the riverfront near the base of this building. Now that this clock is a mandatory reporting point, be sure you don't confuse it with the clocks on the Hoboken Terminal (one mile north of the Colgate clock) or the Jersey Central Railroad Terminal (just north of Ellis Island). The 30th Street Heliport is very hard to spot. The rectangular helipads are outlined and marked with Xs. This heliport's Unicom frequency is the one used by all traffic in the Hudson River part of the exclusion zone. Just to the north of the heliport, on Manhattan's Pier 86, is the Intrepid Sea-Air-Space Museum. Many pilots report the Lincoln and Holland Tunnels. By definition, a tunnel is not visible from the air. But there are ventilation towers at each end, and these are visible from the air. The Lincoln Tunnel is between the 30th Street Heliport and the Intrepid. The ventilators for the Holland Tunnel are much easier to see, about half a mile north of the Battery. Look for the Teardrop Memorial about two miles south of the Lady in Bayonne, N.J. at the end of a pier. This is Zurab Tsereteli's ode to the disaster of September 2001, donated by the Russian people. Since 2001, the Department of Homeland Security has added restrictions to the use of these routes. When the New York Major League baseball teams play at home, a generic flight restriction closes some of the airspace over the Hudson River or near LGA. So long as Donald Trump is President, there will be a flight restriction over midtown Manhattan, FDC 7/5997 (plain text here). This forbids GA traffic over the city within a one-mile radius of a point near Trump Tower. The TFR covers all of the piers just upriver from the Intrepid, and almost half of Central Park. It does not cover the 30th Street heliport or the large reservoir in Central Park. It was re-drawn a couple of times until they finally got a definition that specifically allows the Hudson River routes. If you're flying the Blue Route, leave a little extra room for this restriction, but be sure to curve back to the North Tip before continuing eastbound. This map shows where we can't fly. In August 2009, a tour helicopter climbed into a transient Cherokee whose pilot was not monitoring the corridor frequency 123.05. Everyone aboard both aircraft was killed. The FAA responded almost immediately by enacting new rules for traffic over the Hudson and East Rivers. Some long-standing common-sense suggestions are now requirements, and the new rule mandates position reports at six locations. There is now a speed limit in this area: 140 knots. If you're just passing through, you must fly an altitude between 1000-1299 feet ASL. If you're sightseeing (anything besides "just passing through"), you must fly below 1000 feet ASL. You must have a current New York terminal chart in the airplane. You don't have to fly past all six mandatory reporting points, but if you do, you must report your position if you can get a word in on the frequency. Alpine Tower, a large antenna mast in Alpine, N.J. Clock, also commonly reported as "Colgate" or "Goldman Sachs"